The advantage of wooden storage in the office is that wood is strong, hard-wearing, easy to sustain and good value for money. 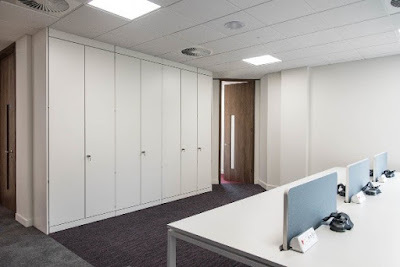 Choosing wooden storage solutions is a good option for a welcoming look in the office area, as this looks like more of a homely environment. Metal sometimes looks a little cold and uncharacteristic. Another great thing about wooden storage is that it is available in such a wide choice of finishes it can fit in with any office space. In addition, most of our wooden storage ranges are supplied with a full five-year guarantee for peace of mind. Metal storage is frequently found in office spaces as it is strong, durable and low maintenance. Selecting metal storage is a good idea if a modern look is desired. Metal storage can also create a professional image in the office. Metal storage is very durable and is available in a wide choice of colours. To boot, some of our metal storage is supplied with a full ten-year guarantee! Built in storage is a great way to make the most of the office space. The built-in storage is fully bespoke, so this can be tailored to the exact specification that it required – whether this is plain shelves or pull out filing frames. All of our built-in storage ranges are fully lockable which ensures that safety and confidentiality is paramount. All of our built-in storage is supplied with a full five-year guarantee. It is always important to measure the space available in the office space to help decide how much space can be allocated for storage. We offer a free 3D CAD and space planning service that can help with this. It is important to take into deliberation where the other office furniture is going to be positioned. It is fundamental that enough space is left around the furniture and storage for people to freely move around the office space. Allowing space for opening doors, drawers etc is also something that must be considered – again, our space planning service can help with clearances in the office space. It is Key to evaluate the amount of storage that is needed. You will also need to how much of each type of material is going to be stored so this will also affect the amount of certain storage types that are needed. An allocated budget should be set before anything is spent on storage. Although the amount spent may want to be limited, it should also be acknowledged that good storage will potentially save both time and money in the future. If customers or potential customers are visiting the office, then the design is very important to create a professional image. Storage is available in a wide range of designs which allows personal taste to be added to the work environment. Again, our free 3D design service can help with the end goal for the office space. This service also allows the buyer to see what the finishes will look like and what different configurations will look like in the space. The word 'Verve' means passion, enthusiasm and creativity. That is what we strive to provide our customers, through our extensive ranges of furniture and our unique customer approach. We offer a 'non pushy' approach to sales, working at the pace of the customer, making sure that you get the best advice, service and value- that is why so many of our customers come back to us. Click here for more information about us and our services. Why does office furniture improve productivity?